The region is seeing positive labour market trends, and is benefitting from higher EU funds inflows and the strong cyclical upswing in Germany and other Western markets. 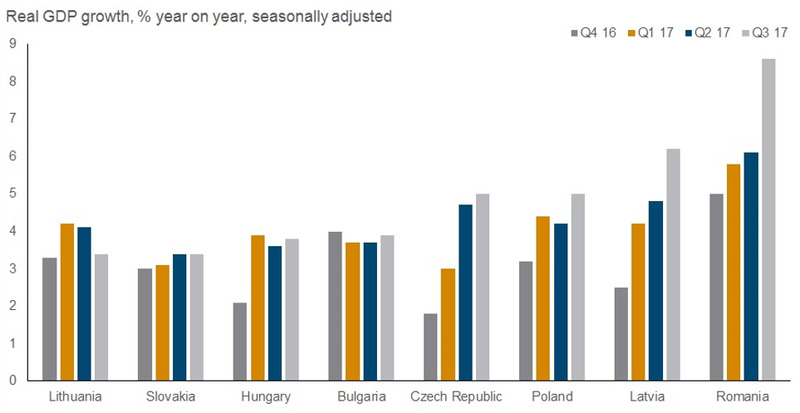 Q3 GDP data for most countries in EU-CEE indicated another very strong three months of growth for the region. This reflects a combination of rising employment and wages, inflows of EU funds, and the robust upswing in Germany. We expect strong growth rates to persist in the near term, and recently revised up our 2017-19 growth forecasts for most EU-CEE countries. However, we continue to note that the region faces significant challenges over the medium term. These include an expected slowdown in Western Europe, demographic decline, labour shortages, a smaller post-Brexit EU budget, and political risks. Convergence with EU average per capita income levels will continue in the next few years, but as countries get wealthier, their pace of convergence will slow. By 2026 no EU-CEE country will have reached the EU average per capita GDP level. Economies in EU-CEE had another impressive quarter of growth in July-September, according to flash estimates of GDP data released by Eurostat on November 14th. After an already very strong start to the year, the latest data suggest little or no let-up in momentum in Q3. In most countries for which data were released, growth either remained roughly at the same level as Q2, or strengthened further. 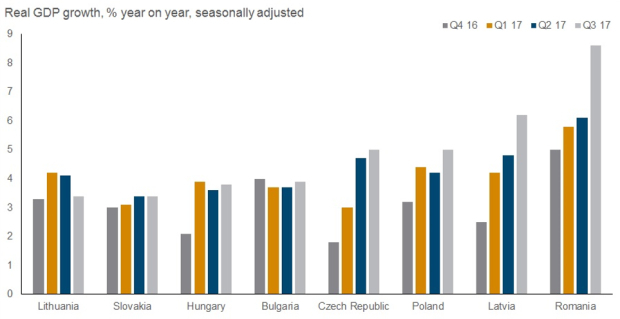 Seasonally-adjusted real GDP expanded by 2.6% in Romania (2% in Q2), 1.5% in Latvia (1.4% in Q2), 1.1% in Poland (0.9% in Q2), 0.9% in Bulgaria (1% in Q2), 0.8% in Hungary and Slovakia (both grew by 0.9% in Q2). 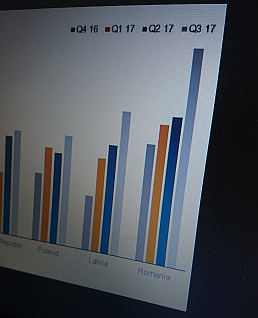 Some of the year-on-year growth rates were particularly impressive; Latvia grew by 6.2% in Q3, and Romania by 8.6%. Quarterly momentum slowed somewhat in the Czech Republic (0.5% in Q3, from 2.5% in Q2), and more significantly in Lithuania (0.1%, from 0.6% in Q2). However, even here, year-on-year rates remained robust; the Czech economy expanded by a very strong 5% year on year in Q2, while Lithuania grew by 3.4%. Data for Croatia, Estonia and Slovenia are not yet available. Several important factors are continuing to support growth in the region. First, labour markets are generally tight, with employment and wages both rising quite strongly (this could endanger competitiveness in the medium term, but for now we do not view this as a risk). Second, investment is rising, underpinned in part by EU funds. Third, the external environment—and particularly growth in key markets in Western Europe—is highly supportive. Growth in Germany—an important market for all EU-CEE countries—reached 0.8% quarter on quarter and 2.8% year on year in Q3, very high rates in the recent context. We have also long been of the view that political risks to growth in Western Europe were overstated. So far this has proven to be the case. In our recent Autumn Forecast, we made a number of upward revisions to our growth projections for countries in EU-CEE. We believe that the current positive momentum has further to run. Germany and other key Western markets look set to continue to grow strongly in the coming quarters. Even Italy—an important markets for parts of EU-CEE—looks better, with the economy expanding by 0.5% in Q3, up from 0.3% in the previous three months. Meanwhile positive labour market trends and higher inflows of EU funds will continue to push up private consumption and investment spending in EU-CEE countries. Nevertheless, beyond the next couple of years, we still see major challenges for the region. The eurozone upswing is cyclical, and reflects to a large extent catch-up growth after what has been effectively a lost decade. As such, it is likely to peter out at some point, which will be a particular challenge for the open, export-oriented economies of Central Europe. EU-CEE countries face material demographic challenges, and labour shortages may become an increasing impediment to growth during the medium term. After Brexit, the EU budget will be smaller, meaning that EU fund inflows—which in net terms tend to equal several percentage points of GDP per year for EU-CEE countries, and are an important driver of public investment—will be lower. Meanwhile the push for greater integration at the core of the EU could have a negative impact on EU-CEE. The latest data indicate that many countries in EU-CEE are seeing fairly rapid convergence with Western European income levels. This is likely to remain the case in the next 1-2 years. However, in a Special Section of our Autumn Forecast, we projected forward rates of convergence for countries in the region. As countries in CESEE become wealthier, their pace of convergence will slow. Even by 2026, we do not expect the Czech Republic (the wealthiest EU-CEE country) to have caught up with EU average per capita income levels. Meanwhile, Poland and Hungary will not even have reached the 80% mark by that point.